McIntire Park contains land originally donated by Paul Goodloe McIntire and continues to be one of the most popular parks in the City. Located off of U.S. Route 250 Bypass, it features rolling land with magnificent views of the mountains to the east, a heavily wooded area with steep and varied topography and winding streams. 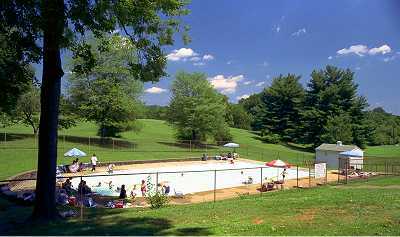 There is a major community focus on the two lighted Little League fields, and the three picnic shelters which are used extensively from spring to fall. (Information on reserving a shelter can be found here.) In April every year McIntire Park hosts the carnival for the Annual Dogwood Festival. In the southeastern half of the park, to the east of the railroad tracks, lies a nine-hole sand green golf course. This section of the park has its own parking lot and offers a playground and wading pool. Near the intersection of the Bypass and McIntire Road is the Dogwood Vietnam Memorial, the first such memorial in the country. McIntire park was originally larger than its current size. The construction of the bypass ran through the park, with one section becoming what is now Greenleaf Park. Another section, at the northeast end of McIntire Road near the rescue squad, initially became tennis courts and more recently has been converted into a skateboard park. Are you interested in the future of McIntire Park? Find out about the effect of the proposed Meadowcreek Parkway here or join in the public discussions taking place. The City is planning to renovate this section of the park and would like to hear your ideas. The McIntire Park Steering Committee held a public meeting Wednesday, July 31, 2002, 7PM, in City Council Chambers at City Hall which included a historical presentation and a public discussion. And as of Sunday, October 13, 2002, the Parks Division is sponsoring "Sundays in the Park" at McIntire Park East at the golf course. You can bring your family, have a picnic, play Frisbee, fly a kite, take a guided walk in the park and fill out a comment sheet. The park will be open to non-golfing activities from noon to closing each Sunday (weather permitting) this fall. Call the Parks Division at (434) 970-3589 for more information.